Our church is starting a new sermon series at the beginning of February called Life’s Healing Choices. The sermon series is going to last 10 weeks, with each week covering a different life choice. And for the first time, certainly in our churches history, we are going to be using our Facebook fan page to hold a live, on going bible study. This live conversation stream can be used by anybody, any time of the day or night, and you just need to login via Facebook to participate! We’ll be using the Facebook application called Live Stream Box. This is a powerful application that allows Facebook users to login, and have a live ongoing discussion in one set location. 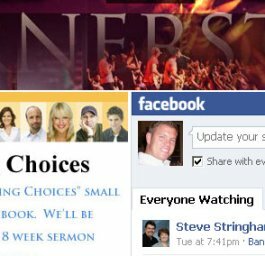 For our church, I’ve integrated this Live Stream Box directly into the main churches Facebook Fan Page >> see the live bible study here. As people interact and comment in the live stream box, those updates become part of the Facebook live stream. That means, any updates that a person makes will in turn be sent out via the Facebook stream to all of their friends. One of the neat things we’ll be doing during the 10 week bible study is having schedule times in which a Pastor from our church will be live, on the Facebook fan page and in the discussion. These live scheduled times for having a Pastor in the discussion will not only encourage more people to show up and participate, but it will also present a great opportunity for ministering to people both in the church, and quite possibly to people throughout the world. We the live bible study as a great tool for encouraging participation and interaction built around biblical messages. The live bible study concept is also an amazing tool for o reach not only the local church body, but also people located throughout the world. This technology can very easily reach people in other countries, and allow for a open platform for Christians to come together and support and encourage one another. Plus, the potential exposure and branding for a particular church is unprecedented, and at a level that may never have been possible until now through the use of Facebook fan pages and the associated technology. Visit our churches’ Facebook Fan page here. Check out our live bible study here.